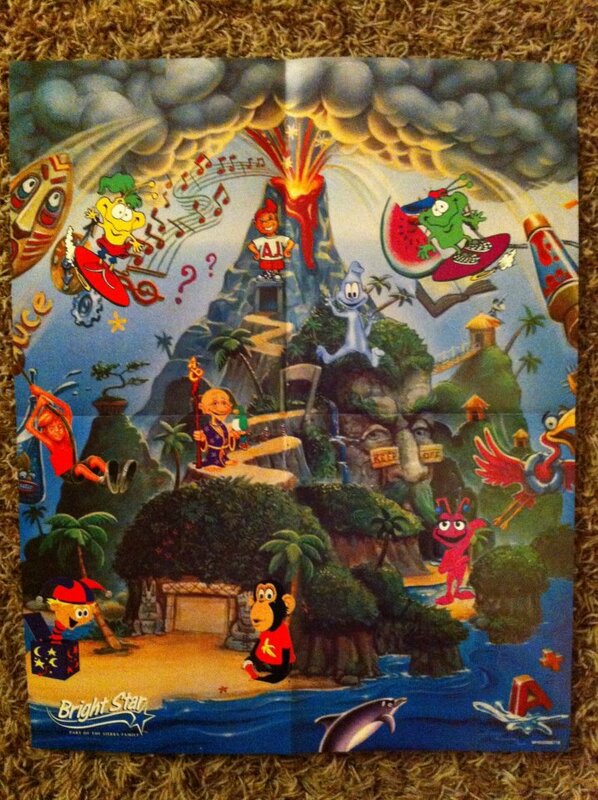 Nearly all the games and game characters on this poster are from the Sierra Discovery series games. We have Bananas and Jack from Alphabet Blocks and Ready Set Read; Yobi from Magic Spelling Tricks; Adam from Lost Secret of the Rain Forest (and Delphenius from EcoQuest 1 in the water); Quarky and Quaysoo from Turbo Science and Mega Math; Adi Junior (furthering our suspicions that there was a Sierra Discovery release of this game...); Spooky from Kid's Typing; Lloyd the alien from Early Math; the flamingo from Castle and Island of Dr. Brain, which the island of course, acts as the setting for the poster.